One of my favorite things to knit is clothes for Dolls. They are small projects that knit up in a short amount of time and give me a chance to experiment with stitch patterns and colors. 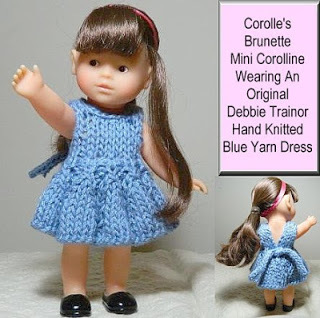 The knitting pattern for this dress, The Bell Skirt Dress, designed especially for the Corolle Mini Corolline doll, has gone through several versions. The finished dress is knit using Universal Yarn Bamboo Pop, a cotton/bamboo DK weight yarn and a U.S. Size 4 knitting needles. It’s a wrap dress that uses ribbon to tie around the waist and finishes with a bow in the back. I originally designed this dress for the Cindy Doll using worsted weight yarn. 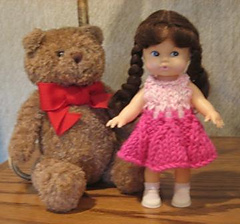 Cindy Dolls are by Fibre Craft and are 6 3/4 inches tall. The knitting pattern for this version is available for free in my Ravelry pattern shop. And when I found the Corolle Mini Corolline Doll, I made it using worsted weight yarn. This final version fits best and the yarn is the ideal size for this doll. This doll will be added to my next Dressing Our Dolls display. Periodically, I display my dolls and their handmade clothes in local Libraries and occasionally, I host a presentation that involves explaining the history behind each of the dolls and the outfits that I’ve made for them. Here’s the link to Dressing Our Dolls with more doll clothes and details.